The garden, a recurring motif in the work of Zurich-based Edelaar Mosayebi Inderbitzin Architects, features prominently in many of their architectural projects as idea, vision, or built space. In their exhibition Garten at Architektur Galerie Berlin in fall 2016, the architects foregrounded that topos and, in collaboration with Swiss landscape designer Daniel Ganz, transformed the gallery space into a living garden. The eponymous booklet features this temporary installation and offers an insight into its making in striking photographs by Jan Bitter and Roland Bernath. 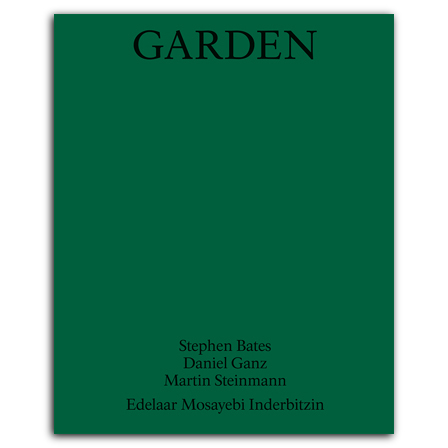 Essays by Edelaar Mosayebi Inderbitzin and Stephen Bates and a conversation with the architects by Martin Steinmann explore the meaning of the garden in a selection of their projects also from a historical and theoretical perspective. was founded 2005 by Ron Edelaar, born 1976, Elli Mosayebi, born 1977, and Christian Inderbitzin, born 1977, in Zurich. The firm’s broad scope of work encompasses design and realization of building projects, urban planning, exhibitions and publications. Housing is a key interest in their research, teaching, and practice. Elli Mosayebi teaches as a professor for design and housing at Technische Universität Darmstadt since 2012. Christian Inderbitzin taught at EPFL in Lausanne 2015-16. In 2017-18, Edelaar Mosayebi Inderbitzin are teaching at ETH Zurich. , born 1964, is a founding partner of Sergison Bates Architects in London and Zurich. He also teaches as a professor of urbanism and housing at Technical University of Munich. Together with Jonathan Sergison, he has taught at various schools of architecture, including London’s Architectural Association, ETH Zurich, EPFL in Lausanne, Oslo School of Architecture, and Harvard Graduate School of Design.